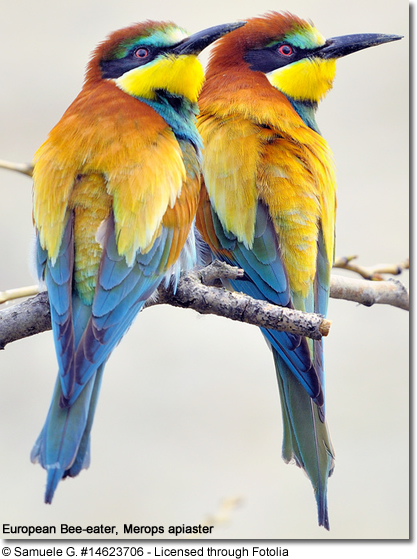 The bee-eaters is a very colorful group of birds consisting of about 26 different species (note: some authorities list 24 and others 26 sub-species). Many consider them to be amongst the most beautiful birds. They are mostly found in Africa, although some species occur in southern Europe, Madagascar, Australia, India and New Guinea (and other islands in the South Pacific). 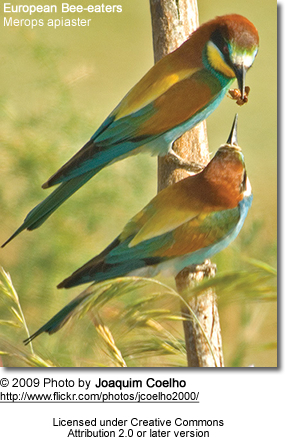 Most bee-eater species are migratory and may travel thousands of miles to their favorite breeding or wintering sites. 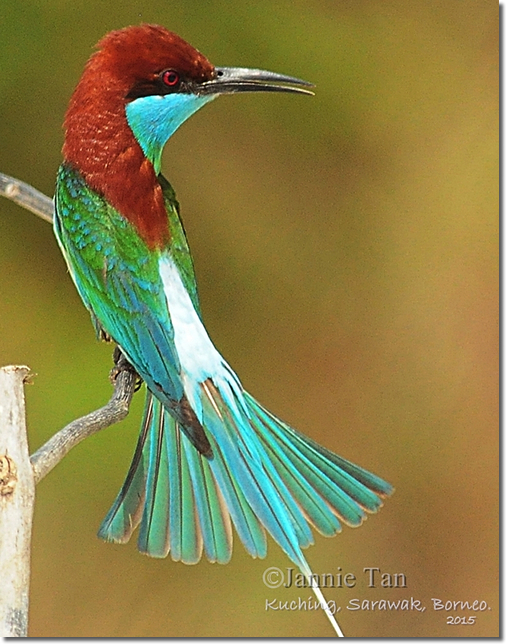 A few exceptions may travel short distances in response to the rainy and dry seasons, such as the African Little Bee-eater. They are characterized by their strikingly colorful plumage . 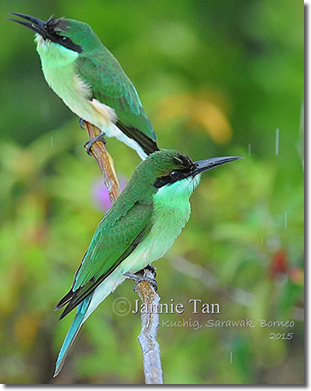 They have slender bodies and usually elongated central tail feathers. They have curved and long beaks that end in a sharp point. Their sharp claws enable them to perch on vertical surfaces and are also helpful when excavating nesting tunnels. Sexes generally look alike, although in some species the males have red irises while the females' are brown-red. In other species, the tail-streamers of the male are slightly longer than the females'. 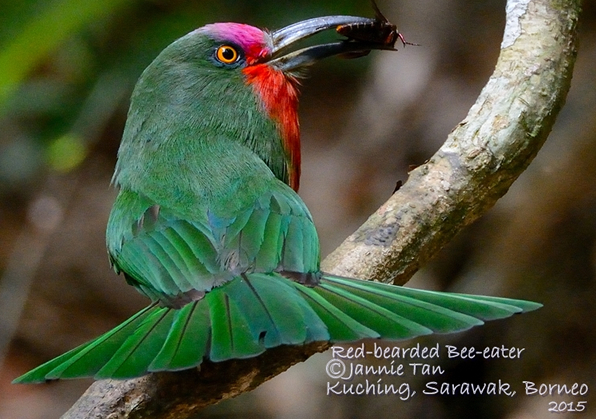 As is suggested by its name, Bee-eater predominantly eats flying insects - particularly bees (honey bees and bumble bees), wasps and hornets, but also dragonflies and other larger insects. They seize them after short dashes and taking the insects back to the perch to eat. Before eating stinging insects, the European Bee-eater removes the sting by repeatedly hitting the insect on a hard surface to kill it, then wiping the insect's abdomen on the perch to discharge the sting. 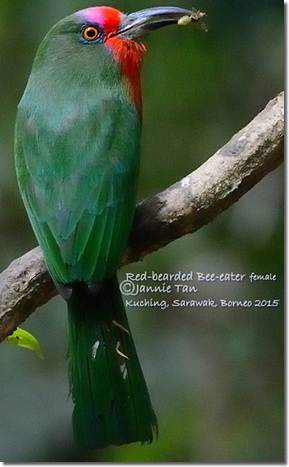 Bee-eaters feed on about 250 bees a day, which makes them very unpopular with bee keepers. 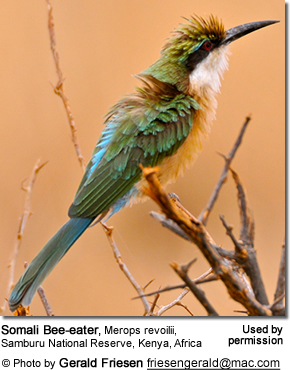 Some bee-eater species also eat vegetable matter. 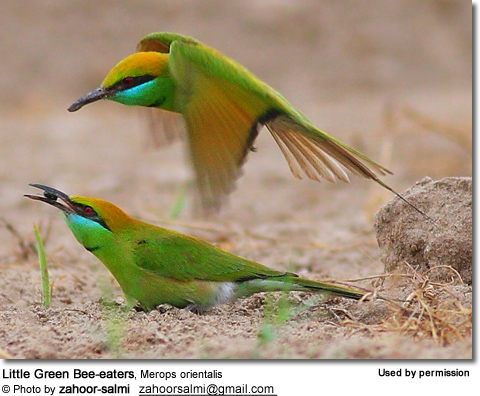 Bee-eaters are colony nesters that typically breed in open country in warmer climates. They are generally monogamous (only one mate); although polygamy has also been observed in some instances. A clutch consists of (depending on the species) 2 - 9 spherical white eggs, which are laid at 2 day intervals, and are incubated for 19 - 21 days. Both parents share the incubation tasks and raising of the chicks.